The Study Group meets on alternate Monday evenings to look in detail at texts taught by Lama Jampa Thaye at the Mikyo Dorje Shedra in Manchester. The Study Group will re-start on Monday 7 January 2019 following the Christmas recess. 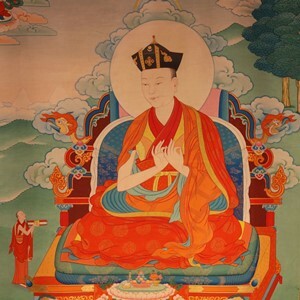 The group is studying the famous commentary by Jamgon Kongtrul on Karmapa Rangjung Dorje’s text “Showing the Buddha Nature.” The commentary is entitled Clarifying the Thought of Rangjung, and was taught by Lama Jampa in Manchester in 2015. If you have received the reading transmission (lung) for this text, which was given by Lama Jampa at the Shedra, you are welcome to join the study group in thinking and meditating on this precious teaching. The Study Group meets at Kagyu Ling on alternate Mondays from 8pm to 9.30pm. Please email john.sainsbury@dechen.org if you’d like to know more. Record of teachings and initiations given in 2016 and 2015.